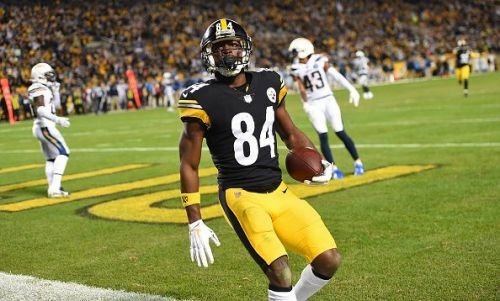 Last week, I stated that the Pittsburgh Steelers were "laying in their bed" with Antonio Brown after he reportedly threw a temper tantrum and reportedly cried when learning of the news that the Buffalo Bills were willing to trade for him with the Steelers. Late Saturday night, news broke that the Steelers have finally found a trade partner to deal the troubled and disgruntled wide receiver to. The Oakland Raiders are sending their third and fifth round NFL Draft picks to Pittsburgh for "AB". Many are thinking that the Steelers dropped the ball on this deal and Brown got in one last laugh on them due to the compensation the Steelers are receiving in return for Brown. But I am not going to jump to that conclusion based on the compensation the Steelers received. Did they truly "lose" this trade for Antonio Brown? I would have to say that they did not. First of all, many forget due to Brown's excellence on the field that he came from Central Michigan University. Many may not even know the school's nickname, The Chippewas, nor the fact that Brown is a product of that university. Many are also forgetting, due to the large outrage immediately coming from this trade, that Brown was taken in the sixth round of the NFL Draft. Surely, Brown can be replaced with a third or fifth round pick. Another rebuttal I would have to those that think the Steelers lost this trade is that they have a superstar in the making in JuJu Smith-Schuster. Smith-Schuster and Brown have both had similar numbers over the past two years as receivers. In 2017, Brown averaged 15.2 yards per catch. That number saw a drop off in 2018, with Brown averaging 12.5 yards per catch this past season. How did Smith-Schuster fare to AB's numbers? Smith-Schuster averaged 15.8 yards per catch in 2017 and 12.8 yards per catch in 2018. Both of those numbers are better than Brown's. Now those numbers may be inflated because Smith-Schuster had Brown shadowing him and taking attention away. But don't think for one minute that the Steelers will not sign a wide receiver this offseason to help take attention away from Smith-Schuster. Another reason I do not think the Steelers necessarily lost their trade with Oakland for Brown is because they have lost star receivers and big players at this position before. Hines Ward was an all-time great Steeler, as well as a two-time Super Bowl Champion, which is something Brown has never won. The Steelers have had success after Ward. They have also lost Super Bowl hero Santonio Holmes who was a teammate of Ward's that made arguably the greatest catch in Super Bowl history to clinch the Super Bowl for the Steelers. They were able to move on from Holmes and succeed after he was gone. The Steelers have not won a Super Bowl title since losing the aforementioned wide receivers, but that is not to suggest they have not had success. Winning always means a team or franchise is successful. However, the Steelers have still made a Super Bowl since that 2008 season title. They also have been to AFC Championship games since. The Steelers had a total malcontent on their hands with Antonio Brown. The guy was in trouble for speeding tickets and was involved in several sideline altercations with coaches. When it comes to the word "loss", the Steelers did lose Brown from their team. But don't think for a minute that Smith-Schuster cannot be a more than serviceable replacement or that they haven't replaced wide receivers that are just as good if not better in the past. The Steelers surely did not lose this trade.